Many researchers cite living more sustainably as humans' most pressing long- term challenge. Living sustainably can be defined as meeting one's needs without interfering with future generations ability to meet their needs. Engaging students with the social causes and effects of sustainability issues may help to address and create dialogue about our own needs and those of future generations. Unfortunately, no studies examine how teachers deliver this topic as a social issue in their classrooms. 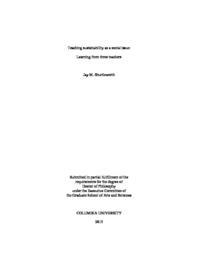 Through the research question, "What are the curricular, pedagogical, and assessment strategies of three teachers when they teach the social issues of sustainability education?" this qualitative case study seeks findings useful to the education field. For example, teachers might learn how peers plan, implement, and assess this sort of instruction. Teacher educators could create or update pre- service education sustainability frameworks. Or, researchers might study the findings' impact on existing educational paradigms. Thus, this study advances understanding within education on ways to sustain humanity's prosperity.